Dry Needling is the use of fine solid (filament) needles to reduce pain through the stimulation of myofascial trigger points. Trigger points are “hyper irritable” points within a muscle created by a thickened band or “knot” of muscle. These trigger points can be very painful when palpated and can refer pain to other regions of the body. Trigger points can also lead to a muscle “switching off” or reducing the strength of its contraction. Dry needling at trigger points has been shown to result in a reaction from the central nervous system, allowing the muscle to relax and producing analgesia. This analgesia then allows us to appropriately assess and manage muscle conditions with reduced pain and hypertonicity. Filament needles are incredibly fine and for this reason there is minimal to no pain felt when inserting the needles. There is often a “local twitch response” noted when needles are inserted into trigger point with a rapid contraction of the muscle and sometimes a brief “cramping” type sensation is felt. It is important to note that some people are considered “Strong” responders whilst others are considered “Weak” responders. Essentially a Strong responder has very large reactions both at the time of treatment and in the days following the appointment. Conversely, Weak responders have little or no reaction to the application of needles or in the days following. This has, however, no relevance to the potential success of the treatment. Dry Needling is seen as an adjunct to other treatments and will not alone eliminate the problem or injury. By reducing trigger points we are able to perform movements more efficiently and with reduced pain, facilitating better and more functional rehabilitation. 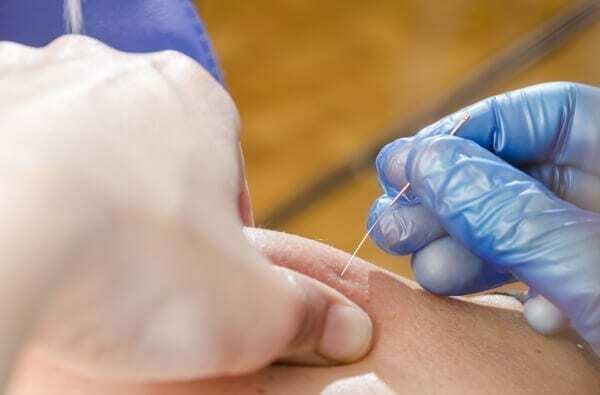 At AC Podiatry, we generally advocate four appointments over two weeks to determine whether or not Dry Needling would be the best treatment modality for you. We believe this is enough time to determine if your body is responding to the treatment in such a way that it would be of continued benefit.